Place chicken breasts into a pot that can fit both breasts in a single layer and cover with water. Bring to a gentle boil and simmer until cooked, about 10 minutes. Check by removing, and slicing through the middle; look to see that it is no longer pink. Allow to cool. Refrigerate or freeze the stock for use in future recipes. Cook soba noodles in a pot of boiling water, according to the packet, being careful not to overcook. Drain, rinse in cold water, and drain again. Place into a bowl with the ginger, carrot, capsicum, chilli and spring onions. 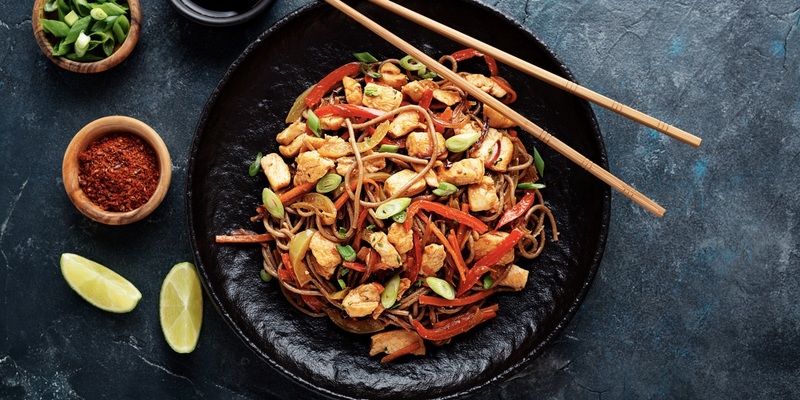 Shred the cooled chicken breast and add to the noodle mix. Combine lime juice, mirin, sesame oil and tamari. Add to the chicken and soba noodles. Mix well and serve sprinkled with sesame seeds.